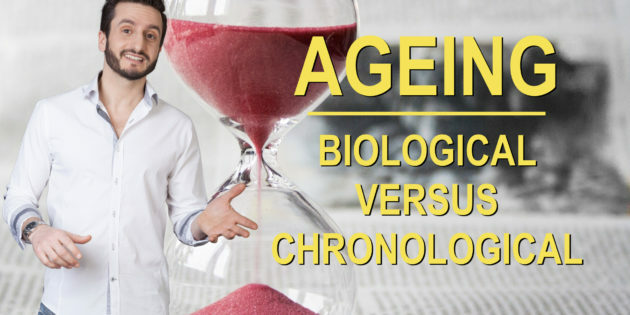 Biological Versus Chronological Ageing. Do you know that you have a biological age as well as a chronological age? And that a young biological age is ultimately more important than your chronological age? Your chronological age is simply how long you have been around for. How many years on this planet. It’s the age that you normally give and what’s in your passport or ID. The reality though is that it’s not really a good indicator of how young or old you really are. We all know 40 year olds who look and feel more like 30 and others that look, feel, act and speak like they are 50 or worse! Indeed, why should insurance and other services be based on this outdated number? What is more important is (in my opinion) your biological age. Your biological age is simply the true age of your body. What does that mean? Imagine if you woke up one day and had amnesia and no-one knew who you were. And then they tried to figure out how old you were based on a number of different tests. The biological age is the age they would think you were – chronologically. So you might be chronologically 40 years old but for all intents and purposes look like someone 10 years younger. I’m often complemented that I look years younger than I am – Thank you to those that say that. And looks might be one way to think of biological age. But there are other ways that you can measure biological age. The telomeres are the protective bit at the ned of your chromosomes. A bit like the iglets at the end of your shoelaces. As you age (chronologically) your cells divide and as they divide, your protective caps get shorter. This is a biological sign of ageing. However, you can increase the production of telemorase (an enzyme) and this can increase the length of the telomeres. Effectively making you (biologically) younger. Indeed, Dr Elizabeth Blackburn won the Noble Prize for discovering telemorase in 2009. Things like stress reduction techniques, meditation and certain dietary and lifestyle interventions can boost the productions of telemorase. And there are probably tons more. I suspect the best way would be to combine as many as possible and get a number at the end of that. Comparing each result to a typical aged person will then give you how you compare to someone in that age group and you’d be able to derive a true biological age. I believe it’s more important to know and work towards a young biological age as there is something that can be done about that. You can’t stop the chronological age. That is going to happen to you regardless. The principles that I teach in The Leadership BEAT Model (blog here: http://harikalymnios.com/the-most-important-blog-post-you-will-ever-read-the-four-keys-to-superhuman-living online course here: http://thethoughtgym.com/superenergy/ ) will help you to achieve the best possible chance of reducing your biological age and looking and feeling years younger. How old do people think you are? Let me know below.